When "System Restore" was added to Windows XP, it changed the life of a lot of computer geeks – and their clients. 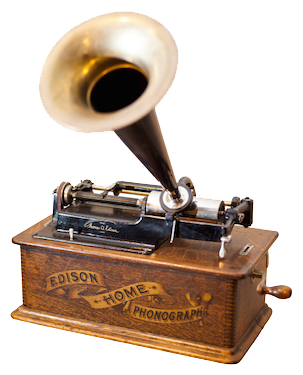 The ability to ‘roll-back’ a computer to a point in time prior to a virus/malware or just a bad install of a piece of software made for a MUCH easier and quicker solution than reformatting a hard drive. System Restore works 98% of the time. The other 2% is left to those really nasty viruses that have figured out how to corrupt or remove the restore points, and to those users who (for an unknown reason) have turned it off. I can’t express my LOVE for this tool over the many other tools I use in my daily life as a computer geek. Here’s a classic scenario: Jim calls me and says "I clicked on something and now whenever I try opening a file, a website loads telling me I need to install their anti-virus software. WHAT DO I DO?!" If you’re using Windows XP (WHY are you STILL using Windows XP?! 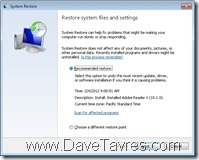 ), you click START / Programs / Accessories / System Tools / System Restore. 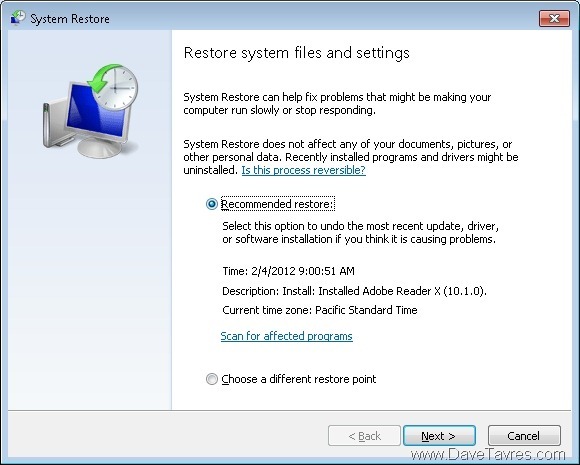 If you’re using Windows 7, you click the START button and just type "System Restore", then click on the program. Or, if you HAVE to click through the menus, click START / All Programs / Accessories / System Tools / System Restore.